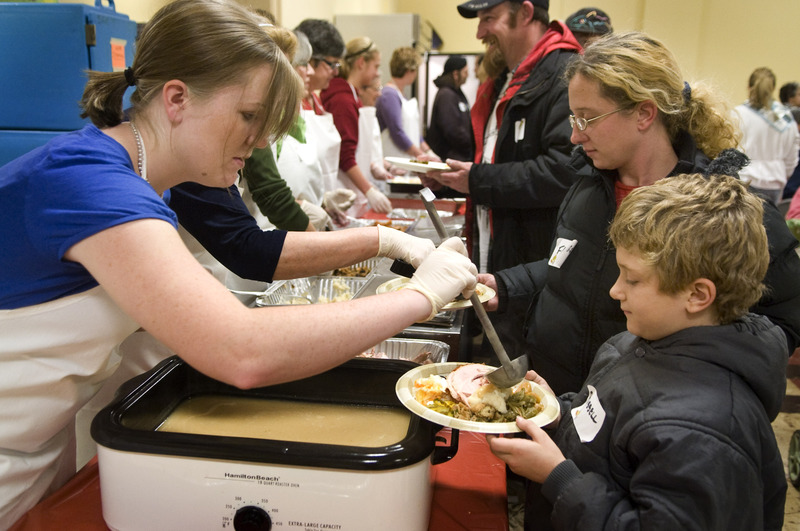 View the locations of free Thanksgiving dinners on a map. The recession is finding its way to the dinner table for more and more people. A new federal survey shows the number of people without a steady, reliable supply of food was at 15 percent in 2008, the highest since statistics on “food insecurity” began. And while the figures for Washington and Idaho were somewhat better, local experts say the stats just haven’t caught up with this year’s reality. The crowds at the region’s first free Thanksgiving dinner Tuesday night were bigger than in years past, organizers at the Women’s and Children’s Free Restaurant said. Food bank operators are seeing huge increases in clients, officials say. And caseloads for food stamps have been rising steeply this year – Washington’s increase from last August to this year was the country’s second-highest, and Idaho’s was fourth-highest. The Agriculture Department’s survey, released Monday, showed that food insecurity had risen from 11.1 percent to 14.6 percent from 2007 to 2008. The survey reflects that more families, at some point during the year, ran out of food, missed meals, ate less than they felt they should or otherwise stretched to make it until their next paycheck or trip to the food bank. Using three-year averages for the state statistics, the survey found food insecurity in Washington was at 11.1 percent for 2006 to 2008, roughly the same proportion as in 2003 to 2005. But compared with last year’s report, the number of Washingtonians worried about their next meal was actually up 13 percent, said Linda Stone, senior food policy coordinator for the Children’s Alliance. Those with “very low” food security – meaning someone in the household had missed a meal – rose 24 percent, she said. “We’ve known for some time that the prevalence of hunger is rising,” Stone said. Marlene Alford, executive director of the Women’s and Children’s Free Restaurant, said her organization saw an increase in families it helped last year – and an even more dramatic one so far in 2009. The restaurant served 12 percent more meals this August, compared with last year. Its Thanksgiving dinner at two locations Tuesday night was on track to more than double the typical serving of roughly 500 meals from years past. Idaho’s figures showed a big improvement in the average for 2006-2008, compared with the previous three-year period – dropping from 14.1 percent to 11.4 percent. But Kathy Gardner, director of the Idaho Hunger Relief Task Force, said the improvement came before the worst of the recession struck. “Idaho is now experiencing quite a spiral, and I would suggest a survey today would reveal a different situation,” she wrote in an e-mail message. The new survey shows that ethnic minorities, single-parent families and rural residents had a harder time keeping food in the pantry. Chandra Champagne, a 30-year-old Deer Park mother of five, has relied on food stamps and the GreenHouse Community Center food bank for several years to supplement the family food budget. But in recent months, her husband has seen his hours at a local grocer cut to 14 a week, and they’ve had to rely on that help even more. Another Greenhouse client, 66-year-old Cary Johnston, said she goes to the food bank once a month. Without that help, she said, it would be “pretty much impossible” to have enough to eat for the month on her Social Security income.